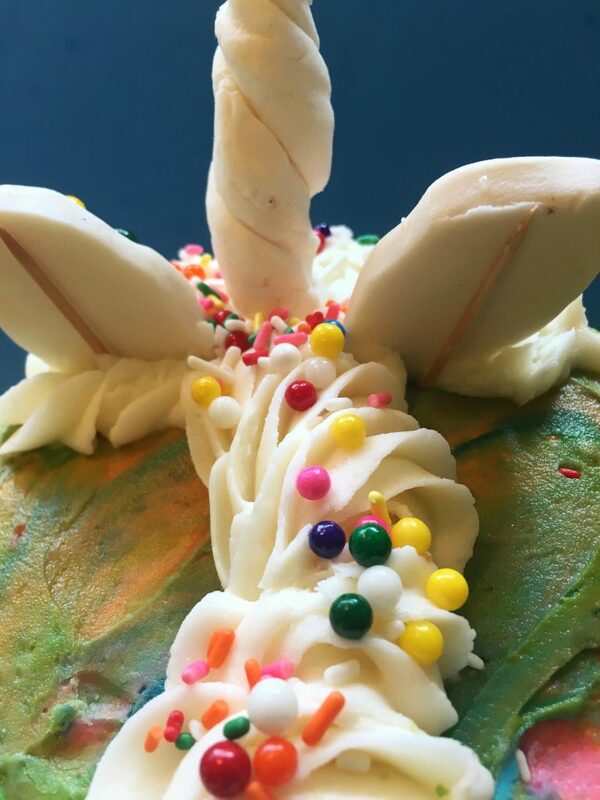 Unicorn cakes are very popular right now. 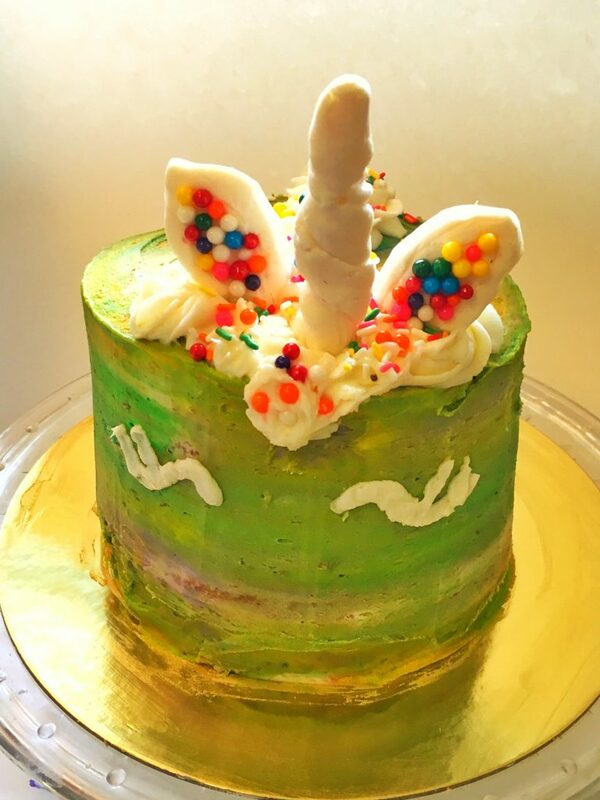 People are having unicorn themed birthday parties and at all the parties there are unicorn cakes. My 6-year-old daughter has asked me to make her one several times. I usually avoid decorating cakes. Baking is something that I love to do but I’m only “okay” at decorating and usually don’t think it’s worth the time and effort to do on a cake that everyone is just going to eat. I was challenged on my Facebook page to make a popular unicorn cake by Sugar Hero that has been going around. I decided to accept the challenge and try something new. 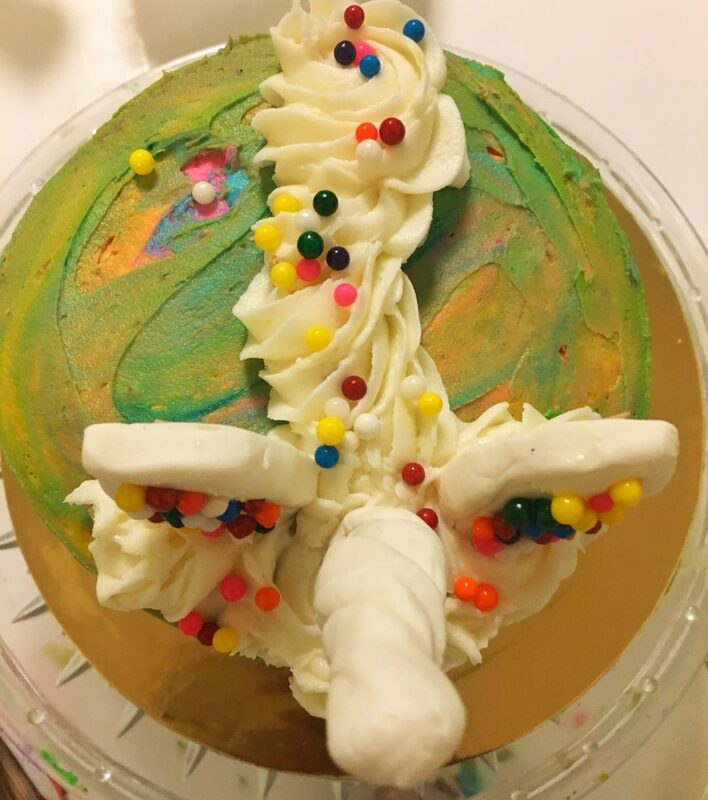 My daughter was very excited that I was going to make her a unicorn cake. Decorating cakes with little kids is a handy skill to have so that you don’t have to spend so much money on buying birthday cakes. 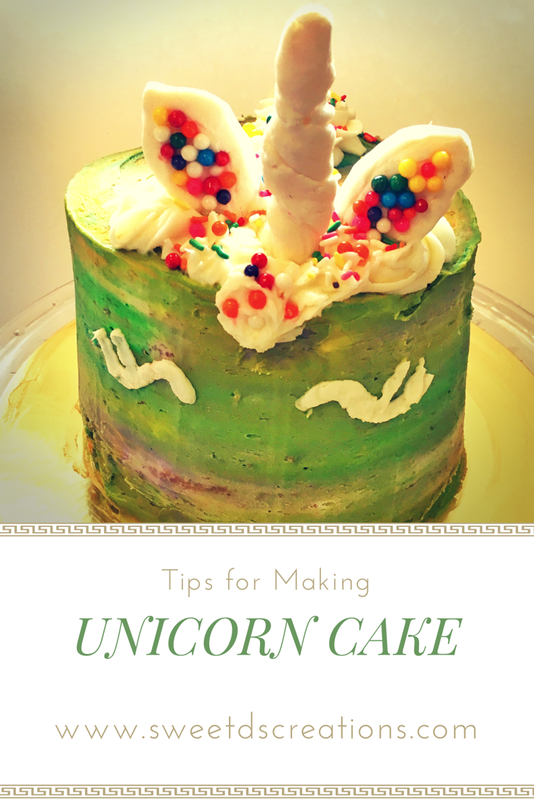 So, I thought making this unicorn cake would at least teach me a few new cake decorating tips. So, I watched the video of Sugar Hero’s unicorn cake over and over. 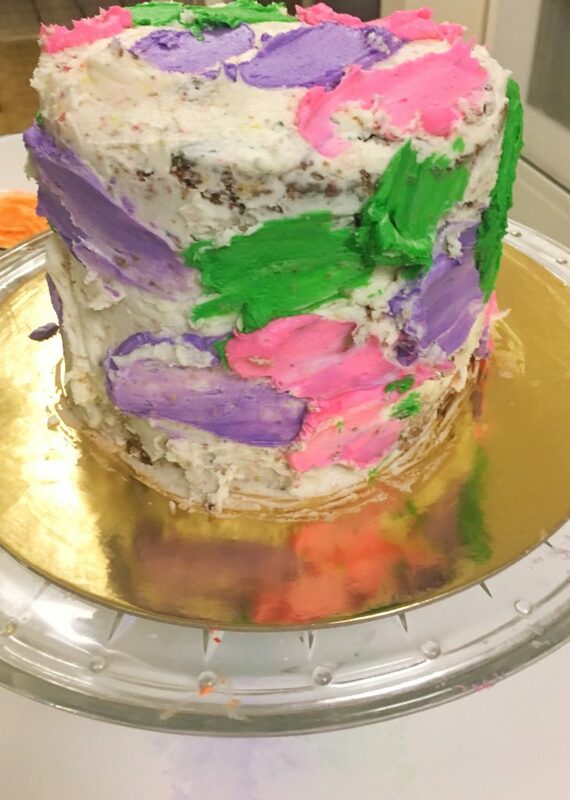 The cake is basically a layered cake with a lot of colorful icing and a fondant horn and ears on top. 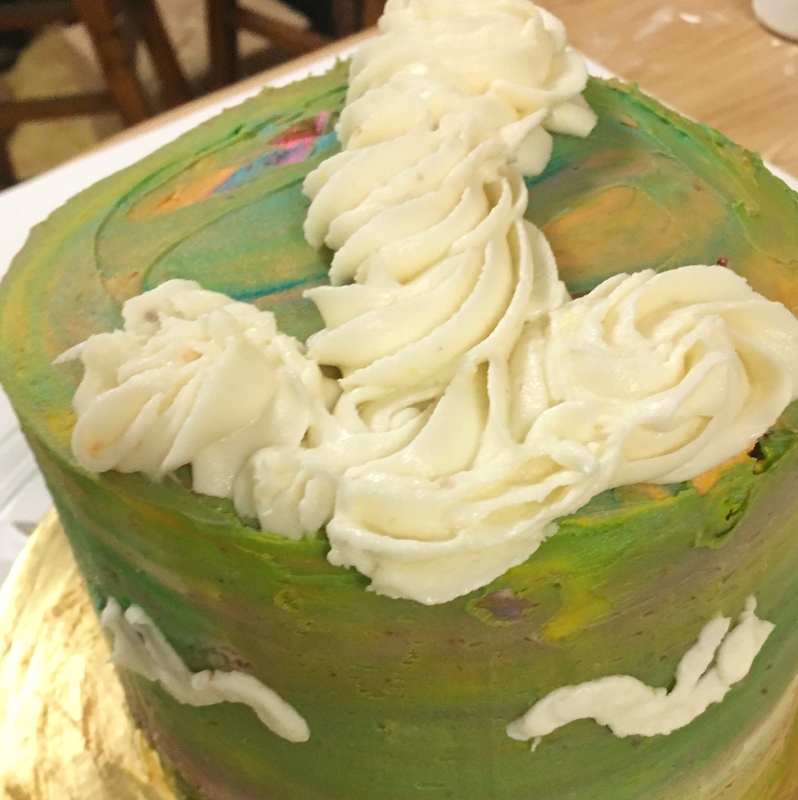 I thought all the different color cake batter and icing would be a pain, but I was up for the challenge. My first cake was a fail! 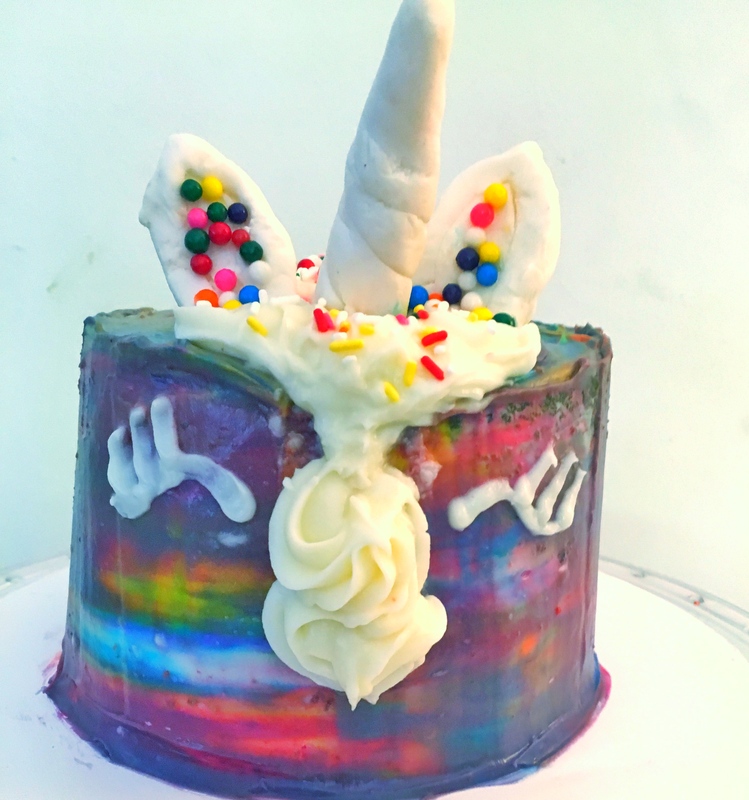 The colors were too dark and my unicorn’s mane at the top slid down the cake. Also, all the sprinkle started falling off of the ears. Picture below. I was determined to get this right. I had found a lot of mistakes with my first cake. Let me walk you through some so that you don’t have the same issues when making this cake. You will need A LOT of icing and food dye. Separating all the different batter and icing is very annoying and messy. Make sure you have enough bowls and even amounts in each one for the colors. Also, be careful to always use a clean spoon or spatula so that you don’t mix up the colors. Remember to keep white icing for the first layer of icing on the cake, the unicorn’s mane, and the eyes. Make the ears and horn ahead of time. You want the fondant to be firm prior to putting it on the cake. 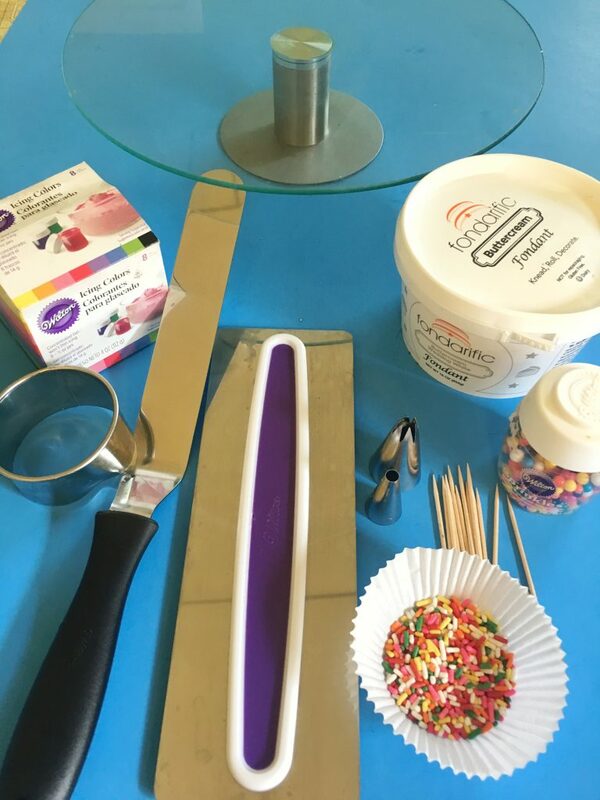 When making the ears and attaching the sprinkles with corn syrup. Make sure they dry. I didn’t do this on my first cake and the sprinkles rolled off after they were on the cake. Additionally, I also added a layer of corn syrup to the top of my sprinkles to make sure they were stuck on the fondant. I let the ears dry for 2 hours prior to putting them on the cake. Use Toothpicks: My ears and horn also fell back the first time they were on the cake. So I attached toothpicks to the back of the ears and horn to keep them in place. Be careful how far down the cake you put the mane and make sure your icing is very stiff. My first attempt, I put too much icing on the cake and it slid down the front. The 2nd time I was a little more cautious with the icing and put a small amount. This is very hard to control. 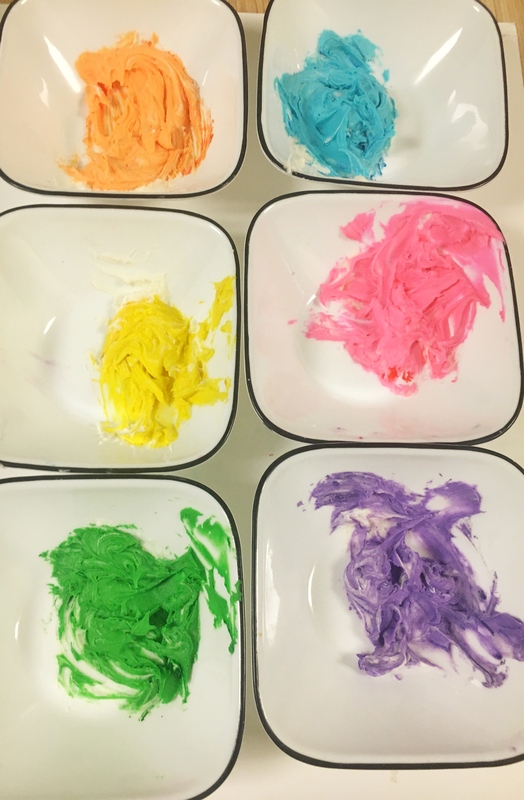 once you put all the colors on the cake and then scrape it, I found the colors ALL mix together and create new colors. My first cake had a dark purple and my second cake was green! You may try limiting the number of colors or making sure yellow and blue aren’t next to each other to avoid this. Next time, I think I’ll stick the green altogether. Corn Syrup for sprinkles on ears. Toothpicks to hold up ears and horn. Wilton Tip 10 or smaller for eyes with a piping bag. Bake your cakes, remove from pan and let cool for 4 hours. 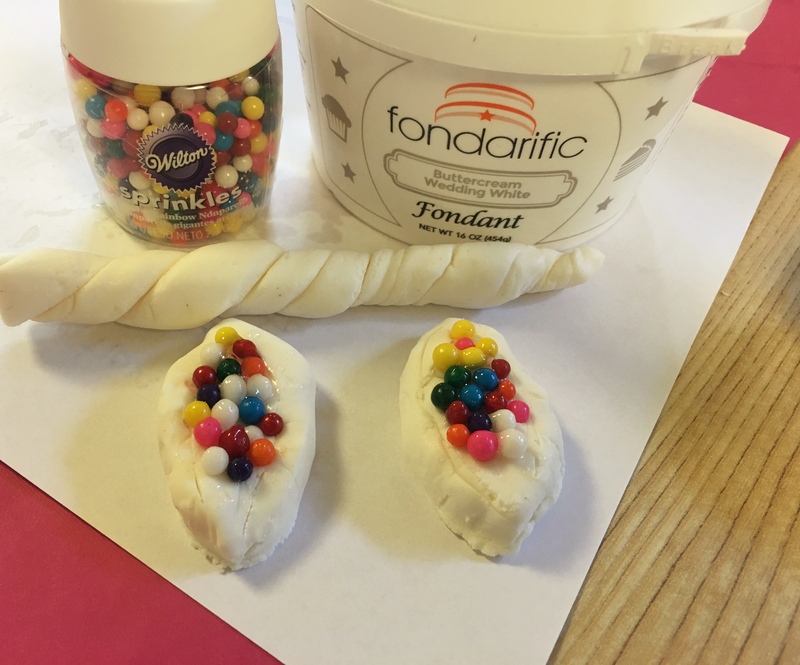 Make Fondant horn and ears. Per the video, use the cookie cutters to make the ears. Using sprinkles and corn syrup, put sprinkles on ears. Let dry to make sure the sprinkles are attached to ears. Make Icing. Dye icing the 6 different colors and leave white icing for the outside of the cake and for the top of the cake. Cut the cakes and add icing to the center of the cakes as you stack them. Cover the entire cake with white icing. Smear different colors of icing around the cake entire cake. Be careful of putting yellow and blue next to each other. Using the smart icing smoother, mix all the icing together. 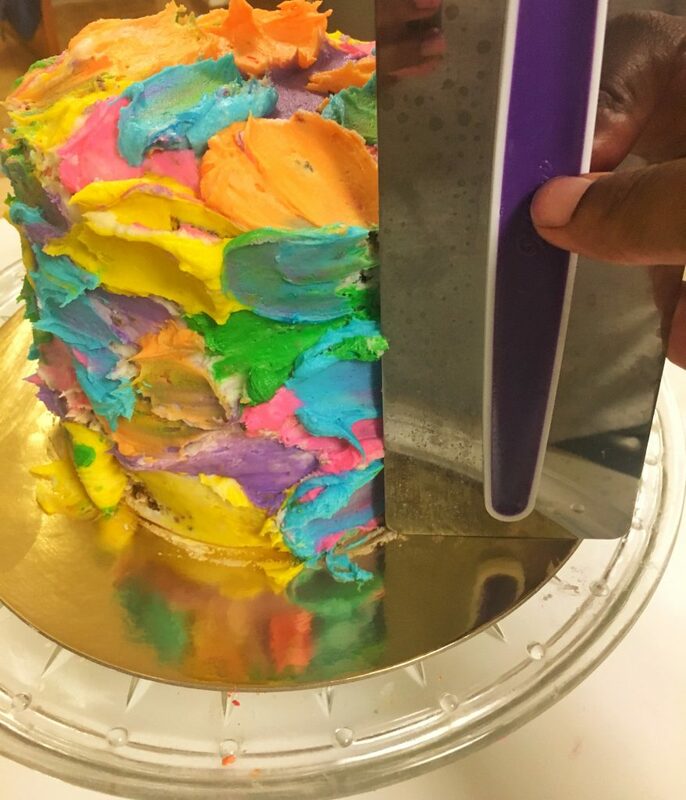 Try to make sure you are scraping the cake evenly so that you only have to go around once. Using a Wilton 1M Tip to make the Unicron mane across the top. Using a Wilton 10 or smaller draw the eyes. Attach the ears and horn. Use toothpicks as necessary to help them stand straight. Decorate unicorn mane with sprinkles. My second cake turned out much better, but as mentioned above, all the yellow and blue mixed together to make green! Not the color I had intended. I definitely learned about making shapes out of fondant and how to use an icing smoother. So, it was a fun experience that was also a lot of work. 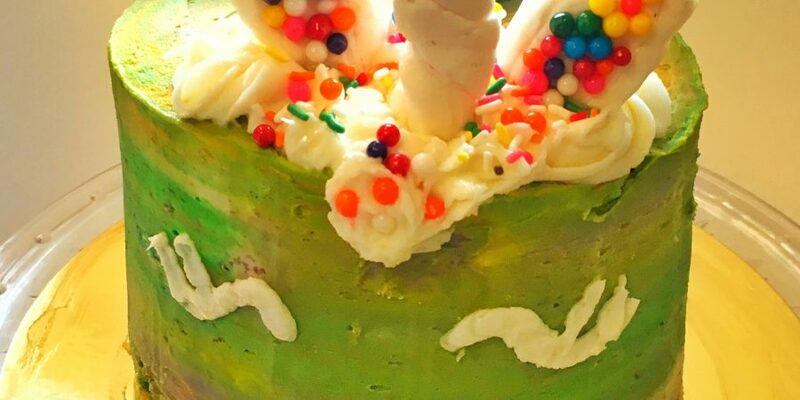 Have you tried the unicorn cake? Do you have any suggestions or tips to share?